NowPresso Review – A Portable Espresso Coffee Machine that Boils Water! 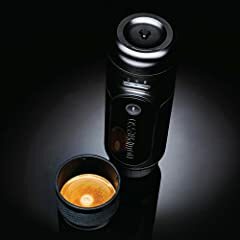 A hands-on review of the Nowpresso – A portable espresso machine that uses Nespresso capsules and boils the water using a rechargeable lithium battery. Thanks for watching guys! and don’t forget to subscribe for the upcoming giveaway! Splendid review. Just curious to know what’s that double walled espresso glass you’ve got there? Great review dude. always love your review. Do you have recommendation for vacuum flask or thermos that can keep hot or cold water for very long time? Nice review.. nice demostration.. nice espresso maker too. Cold water, hot water, whatever… it’s so easy and so good!!!!!! I love it! Fantastic video! Thank you for this it looks great that Nowpresso! Looking forward to part 2! How does the quality of the espresso compare to say the minipresso worth the disadvantage of charging and weight or is it minimal? Nice, do they have a lungo version of the nowpresso?